Super Shine Aluminum Polish: Restores brilliance to dull uncoated aluminum wheels, fuel tanks, trailers, diamond plate, and trim. Can be applied by hand or power buffed. Black residue wipes off easily and washes off hand with soap and water. Provides a long lasting brilliant shine with superior resistance to dulling. To reduce buffing effort, use Busch Aluminum Wash before polishing with Super Shine, and to prolong the shine, follow Super Shine with Busch Aluminum Wax and Sealant. Super Shine is also available in kit form. for drill and hand held buffer useage. Saves time over hand polishing! Apply Busch Super Shine aluminum polish to terry cloth rag, and wipe onto surface. If using by hand, wipe in back and forth motion until black residue appears. Using separate terry cloth rag, wipe black residue away to reveal the shine. With a machine and buffing pad, lightly wipe the polish onto the surface, coating the entire wheel. Let haze for 5 minutes and buff to a shine. 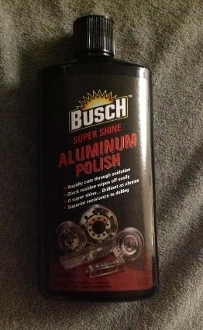 Use Busch Aluminum Wax and Sealant to keep a long lasting shine. Restores shine to bare, uncoated aluminum with minimal effort. Wipe on-wipe off without all the fuss. Can be used by hand or machine. Many competitor polishes only work by hand. Contains corrosion inhibitors that shield metal from the elements. Provides a longer lasting shine. *Take advantage of our special DISCOUNTED pricing available for case of 6 and case of 12 bottles. Compared to other aluminum polishes, more volume for your money!! !